Closed loop water cooling is the big topic of the cooling world right now. Companies such as Corsair, Antec, and Zalman already have products on the market, and the newest entrant into the closed loop scene is Thermaltake. Now Thermaltake is not new to the water cooling market. 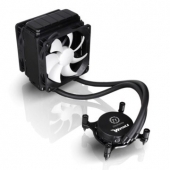 Their BigWater and ProWater series have been out for a while now but they still require assembly and the general hassles and worries associated with traditional water cooling. Today we are taking a look at the Water 2.0 Pro. The new Water 2.0 series consists of the the Performer, Pro, and Extreme models. This Pro model is a standard 120mm radiator but is much thicker than the Performer model. We are going to be doing a direct comparison to Thermaltake’s newest high-end air cooler, the Frio Extreme, as well to get an idea of what we can expect from a similarly priced air and water cooler.